It’s that time again in the publishing cycle: the time when I have to bend my mind to promoting my new novel. 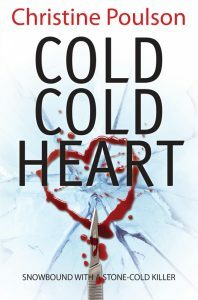 Cold Cold Heart comes out in the UK in November and in the USA in January 2018. It is always a thrill and a privilege to have a book published. But as for the promoting . . . That is another matter. I’m British! We don’t like to blow our own trumpet. Perhaps publishers would do better to emulate the wonderful Ray Brooks, a London estate agent who was famous in the 1960s for brutally honest descriptions of the properties that he was selling. Here’s an example. ‘Do not be misled by the trim exterior of this modest period res with its dirty broken windows: all is not well with the inside. The décor of the nine rooms, some of which hangs inelegantly from the ceiling, is revolting. Not entirely devoid of plumbing, there is a pathetic kitchen and one cold tap. No bathroom, of course, but Chelsea has excellent public baths. Rain drips sadly through the ceiling onto the oilcloth. The pock-marked basement floor indicates a thriving community of woodworm, otherwise there is not much wrong with the property.’ In spite of this – or because of it – he made a fortune. I am not going to emulate Roy Brooks. But nor am I going to claim that my novel is the best thing since sliced bread. I will only say that I have done my best to write a gripping story, to entertain my readers and – perhaps – to keep them up past their bed-time. It will be for them to judge if I have succeeded.